"More students are killed riding their bikes than by school shooters." here before. 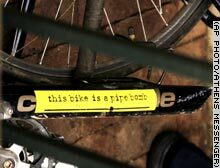 AFAIK we haven't seen a bicycle suicide bomber yet. probably at night with no lights. Or the driver of the motor vehicle was drunk or nearly so. you are reading into the small amount of information Jute provided. 390 of those crashes, or 56 percent of the time, the records show." are never mentioned by bicycle safety advocates. As Pogo said, "we have met the enemy... and he is us." and traumatic brain injury (TBI). He also tracked alcohol use. correlated with TBI in a statistically significantly way. Exactly. I would regard these "The dead cyclist was drunk" reports with some suspicion when they come from a motorist's mouth, even when I accept other data from the same report. The cyclist, being dead, is by definition not there to deny the accusation, and the motorist may use it as exoneration. On the other hand, a pathologist's report that the cyclist showed on analysis a particular blood alcohol dose falls clearly in a more reliable class of data. John's "as many as 21%" is nearer to a fifth than your inflated "quarter". Show us proof, Franki-boy, not your prejudices. Oh, and "consistently" requires several separate, independent pieces of proof. It's this sort of hostile exaggeration that causes other cyclists to consider you an enemy of cycling, Franki-boy. â€¢ In 2016, there were 840 pedalcyclists killed in motor vehicle traffic crashes in the United States, an increase from 829 in 2015. Pedalcyclist deaths accounted for 2.2 percent of all motor vehicle traffic fatalities (Table 1). â€¢ The number of pedalcyclists killed in 2016 is 1.3 percent higher than the 829 pedalcyclists killed in 2015.
â€¢ There were 840 pedal cyclist deaths in 2016, which accounted for 2.2 percent of all traffic fatali- ties during the year. â€¢ Seventy-one percent of pedal cyclists who died in motor vehicle crashes in 2016 died in crashes in urban areas. â€¢ From 2007 to 2016, the average age of pedal cyclists killed in motor vehicle crashes increased from 40 to 46.
â€¢ The pedal cyclist fatality rate per million people was 5.6 times higher for males than females in 2016.
â€¢ Alcohol involvementâ€”either for the motor vehicle operator or for the pedalcyclistâ€”was reported in 35 percent of all fatal pedal cyclist crashes in 2016.
â€¢ More than 26 percent of the pedal cyclists who died in 2016 had blood alcohol concentrations (BACs) of .01 g/dL or greater. I take that to indicate that a large number of bicyclists deaths are the homeless or nearly homeless, drunk or nearly so, and riding probably at night with no lights. Unless you cite a verifiable authority or analysis from linked studies, that's just straightforward slander. It's also a regular mantra from the nastiest of the local AHZ. What do you need Andre? The article shows 71% in urban areas, 62% not at an intersection or in a bicycle lane and 49% after dark or at dawn or dusk. Do you find that hard to interpret or is it simply your position that anyone other than me can use deductive reasoning? Where do you believe that a cyclist death would not end in a trial? And in what country do you believe that a motorist's word of a cyclist being drunk or drugged would be acceptable as evidence? John's "as many as 21%" is nearer to a fifth than your inflated "quarter".. Show us proof, Franki-boy, not your prejudices. Oh, and "consistently" requires several separate, independent pieces of proof. Andre, I don't know where you live but it is pretty much a common problem in California that we have homeless encampments everywhere. Until they finally cleaned it up after months there was one in Oakland three blocks from city hall. All of these people ride bicycles everywhere and these are eventually cleaned out not because of the horror of that many homeless being on the streets but because of used hypodermic needles in large piles and the sidewalks being covered with human feces. If they clean out an encampment of 50 people they are likely to find 1,000 bicycles mostly stolen and broken down. Do you live on Mars? The city allows this sort of thing when they could put portapoties there and clean them daily for a pittance what it eventually costs. â€¢ The pedal cyclist fatality rate per million people was 5..6 times higher for males than females in 2016. Come off it, Tom; you know better than to think I'd pick on you for no reason at all. The thing is, for a radical conclusion such as yours, you need more than one supporting reference point. This is especially true in this forum because the execrable Krygowski, a generally unreliable witness and wannabe polemicist of unbelievable malice, has long sullied the water with pejorative exaggerations about cycle fatalities. There's another one of Krygowski's distortions just yesterday, where he inflated the 21% that you quoted to "a quarter".